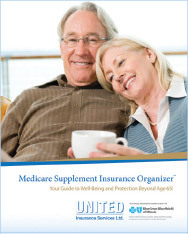 Keep all of your Medicare Supplement plan information organized, in one place. Request your FREE Organizer now! 1 Qualified recipients will receive Medicare Resource Guide. One per household. While supplies last. Not connected with or endorsed by the U.S. Government or federal Medicare Program. 2 Rate for Medicare Supplement Plan F High Deductible in metro area, for Illinois residents turning 65.